THE big-hearted efforts of elite endurance athletes are unlocking secrets that could save average Australians from heart disease and related issues. A Melbourne study into the cardiovascular systems of endurance athletes — whose hearts are up to three times normal size — is building the clearest picture yet of the benefits and concerns of extreme exercise. While the left pumping chamber of a non-athlete’s heart holds about 100ml of blood, those of endurance specialists grow to the size of a soft drink can. Associate Professor Andre La Greche, head of sports cardiology at Baker Heart and Diabetes Institute, has examined hundreds of athletes to show how evolved hearts have benefits including improved performance and a lower resting rate. “The thing that defines an endurance athlete is that they need to pump a lot more blood to the muscles, and the way the heart does that is just by getting bigger,” Assoc Prof La Greche said. “It sounds simple to just say you get a bigger engine but, when you have a heart two or three times bigger, in the same amount of time it can deal with three times the amount of blood. “Normally the heart takes up a portion of the chest, whereas in the endurance athlete there is a clear fight for space going on between the lungs and the heart. While countless studies have shown the health benefits of exercise, most have focused on low-level activity and not the extreme training of Olympic rowers, Tour de France cyclists and ironmen competitors. But using new imaging techniques such as MRI scans, the Baker sports cardiology team are building a clearer picture of how an athlete’s heart performs during extreme exercise. One of the driving reasons for the research is uncovering why endurance athletes have three to five times the chance of heart rhythm problems, such as atrial fibrillation. “At the moment I don’t believe it is a reason to warn people not to exercise, because at the moment it is the only sting in the tail,” Assoc Prof La Greche said. The good news for non-ironmen is that some of the benefits — the ability for the heart to relax and pump better, more efficient electrical process and a stronger structure — can be achieved with hard work. While an average healthy person has a resting heart rate of about 70 beats per minute, the more efficient hearts of most elite cyclists have a resting heart rate below 40 — and some are below 30 — because they can achieve the same work with less than half the effort. 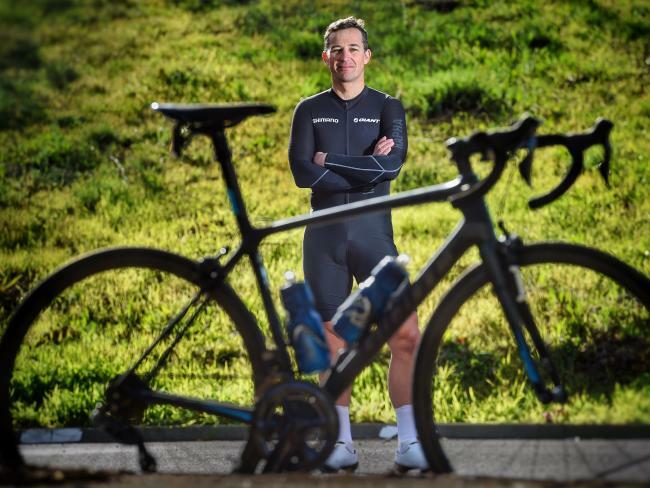 For cyclists such as Dr Mitch Anderson, who this year broke the 12-hour distance world record, having a heart the size of four Coke cans gives him a huge range on the bike, and massive health benefits off it. “I’ve been endurance training for 25 years and it’s hard to know if you choose to do endurance because you have a big heart to start of with, or whether it developed — it’s probably a bit of both,” Dr Anderson said. “The ticker is clearly taking up about half my chest these days, and it is one of the positive side-effects of exercise that you get a stronger heart and at times a greatly enlarged heart. “If you can rev the motor up to 200+ from 45 then you have a pretty good working range,” he said.